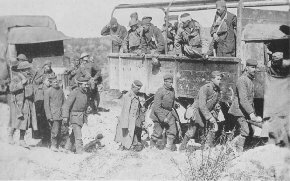 Wounded men, 316th Infantry, 79th Division, in a truck on way to hospital near Malancourt, watching their comrades bring in German prisoners. Sept. 28, 1918. American airplane shot down by the Germans from a height of 2,000 feet. 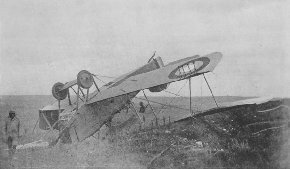 The members of the 9th Aero Squadron who were in the machine, were uninjured. Near Septsarges, September 27, 1918. Never-ending streams of mangled men flowed back. 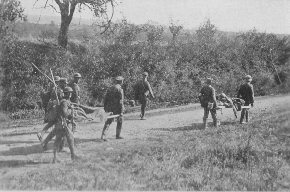 German prisoners carrying in American wounded. Boureuilles, September 26, 1918. 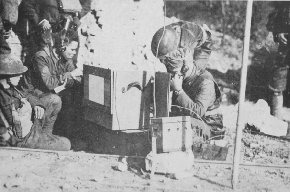 Captain E. G. Stahl, operating a field radio set. Company A, 110th Field Signal Battalion. Varennes, August 26, 1918.